Redmond is a city in Deschutes County, Oregon, United States. Discover out-of-the-way places like John Day Fossil Beds National Monument, Painted Hills Unit and Tam McArthur Rim Trail. Escape the urban bustle at Smith Rock State Park and Steins Pillar. Take a break from Redmond with a short trip to Wildland Firefighters Monument in Prineville, about 36 minutes away. The adventure continues: stroll through Peterson Ridge Trail, look for gifts at Crescent Moon Ranch, play a few rounds at Crooked River Ranch Golf Course, and wander the streets of City of Sisters. For where to stay, more things to do, other places to visit, and tourist information, read our Redmond journey builder app . The Route module can give you travel options from your home to Redmond. Expect a daytime high around 79°F in June, and nighttime lows around 43°F. Wrap up your sightseeing on the 11th (Tue) to allow time to travel to San Francisco. Get some historical perspective at Alcatraz Island and Twin Peaks. You'll discover tucked-away gems like Bodega Dunes and Muir Woods National Monument. Venture out of the city with trips to Castello di Amorosa (in Calistoga) and Pride Mountain Vineyards (in St. Helena). There's still lots to do: take in the views from Golden Gate Bridge, play a few rounds at Lincoln Park, take in the waterfront at Fisherman's Wharf, and head outdoors with Lovely Martha. To see maps, ratings, photos, and tourist information, you can read our San Francisco trip itinerary planner . The Route module can help you plan travel from Redmond to San Francisco. Traveling from Redmond in June, you will find days in San Francisco are slightly colder (71°F), and nights are a bit warmer (55°F). 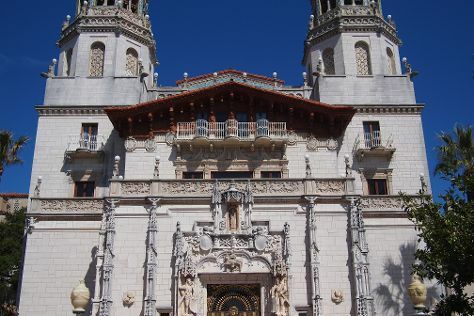 Cap off your sightseeing on the 14th (Fri) early enough to go by car to San Simeon. Kick off your visit on the 15th (Sat): steep yourself in history at Hearst Castle, cruise along Moonstone Beach Dr, and then enjoy the sand and surf at Moonstone Beach. On your second day here, enjoy the sea views from Piedras Blancas Light Station, then enjoy the sand and surf at Piedras Blancas, and then identify plant and animal life at Elephant Seal Rookery. To see maps, ratings, reviews, and other tourist information, refer to the San Simeon route builder . Traveling by car from San Francisco to San Simeon takes 4.5 hours. Alternatively, you can take a train; or do a combination of flight and bus. Traveling from San Francisco in June, expect nights in San Simeon to be about the same, around 53°F, while days are much warmer, around 93°F. Finish up your sightseeing early on the 16th (Sun) so you can go by car to Monterey. Monterey is a city in the U.S. Start off your visit on the 17th (Mon): explore the activities along Monterey Bay, enjoy the sand and surf at Pacific Grove Shoreline Parkway Marine Refuge, and then immerse yourself in nature at Point Lobos. On your second day here, get up close to creatures of the deep with a dolphin and whale watching tour. To see other places to visit, where to stay, maps, and tourist information, read Monterey trip planning tool . Getting from San Simeon to Monterey by car takes about 3 hours. Other options: take a train; or do a combination of car and bus. While traveling from San Simeon, expect colder days and about the same nights in Monterey, ranging from highs of 68°F to lows of 53°F. Finish up your sightseeing early on the 18th (Tue) so you can go by car to Yosemite National Park. Discover out-of-the-way places like Yosemite Falls and Glacier Point. Escape the urban bustle at Tunnel View and Vernal Fall. Spend the 20th (Thu) exploring nature at Bridalveil Fall. There's still lots to do: hike along Tuolumne Meadows, don't miss a visit to Olmsted Point, take in the dramatic natural features at Sentinel Dome, and tour the pleasant surroundings at Panorama Trail. To see reviews, maps, more things to do, and tourist information, use the Yosemite National Park vacation builder app . You can drive from Monterey to Yosemite National Park in 4.5 hours. Other options are to do a combination of shuttle, flight, and car; or do a combination of flight and car. Traveling from Monterey in June, expect nights in Yosemite National Park to be slightly colder, around 43°F, while days are a bit warmer, around 79°F. Finish your sightseeing early on the 22nd (Sat) to allow enough time to travel to Bryson City. The location of an old Cherokee village, Bryson City embraces a quiet side of the Great Smoky Mountains. Kick off your visit on the 23rd (Sun): take in the dramatic scenery at Indian Creek Falls, then admire the sheer force of Juney Whank Falls, and then let the river carry you with a rafting and tubing tour. To see traveler tips, maps, other places to visit, and more tourist information, refer to the Bryson City road trip tool . Traveling by combination of car and flight from Yosemite National Park to Bryson City takes 10.5 hours. Due to the time zone difference, you'll lose 3 hours traveling from Yosemite National Park to Bryson City. Traveling from Yosemite National Park in June, Bryson City is somewhat warmer at night with lows of 59°F. Finish your sightseeing early on the 23rd (Sun) to allow enough time to travel to Nags Head. We've included these beaches for you: Pea Island National Wildlife Refuge and Coquina Beach. Discover out-of-the-way places like Jockey's Ridge State Park and Bodie Island Lighthouse. You'll find plenty of places to visit near Nags Head: Corolla (Currituck Beach Lighthouse and Museum & Nature & Wildlife Tours). There's much more to do: steep yourself in history at Wright Brothers National Memorial, look for gifts at Life on a Sandbar, find your balance on the water with some of the best stand-up paddleboarding in the area, and take a tour by water with Boat Tours & Water Sports. To find ratings, reviews, where to stay, and more tourist information, read our Nags Head trip itinerary planner . You can do a combination of car and flight from Bryson City to Nags Head in 8 hours. Alternatively, you can drive; or do a combination of car and bus. Traveling from Bryson City in June, plan for somewhat warmer nights in Nags Head, with lows around 70°F. Wrap up your sightseeing on the 26th (Wed) early enough to travel to New York City. Deepen your sense of the past at sights like 9/11 Memorial and Ellis Island. The adventure continues: take in the pleasant sights at Central Park, make a trip to Empire State Building, take a stroll through Times Square, and appreciate the history behind Statue of Liberty National Monument. For photos, other places to visit, more things to do, and tourist information, read New York City tour planner. You can do a combination of car and flight from Nags Head to New York City in 5 hours. Alternatively, you can do a combination of car, flight, and bus; or drive. Plan for slightly colder nights when traveling from Nags Head in June since evenings lows in New York City dip to 65°F. Wrap up your sightseeing on the 29th (Sat) to allow time to travel back home.